SmartCEO has honored Nicole Woodland – De Van as a 2016 Brava Award winner. The Brava Awards program celebrates high-impact female business leaders. As SVP, Buying Services & Deliverables, Woodland - De Van sits on the executive board of CMI/Compas. 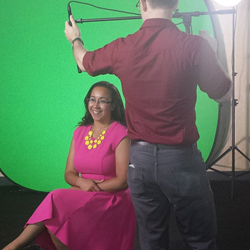 CMI/Compas Executive Nicole Woodland-De Van is interviewed for her SmartCEO Brava Award. "Even the most visionary leaders rarely have a chance to actually change their industry, but Nicole Woodland–De Van has done this and more.,” comments Dr. Susan Dorfman, Chief Commercial Officer, CMI/Compas. Brava award winners combine their irrepressible entrepreneurial spirit with a passion for giving back to the community, and are exemplary leaders of both their companies and their communities. They encourage local philanthropy, mentor up-and-coming leaders and set their companies on the path to tremendous growth. Each year, an independent committee of local business leaders selects winners based on company growth, community impact and mentoring. SmartCEO shares their inspiring stories in SmartCEO magazine and celebrates their success at a high-energy awards gala. “Even the most visionary leaders rarely have a chance to actually change their industry, but Nicole Woodland–De Van has done this and more. Nicole strategically leads media agency CMI/Compas across multiple different initiatives; from building the buying side of the business, to leading a large team, to launching new platforms that literally change the industry. I have the pleasure of working with Nicole daily and see her not just as a colleague and friend but also as someone to emulate,” comments Dr. Susan Dorfman, Chief Commercial Officer, CMI/Compas. While Nicole leads the organization as an executive, she also works closely with her team on development and success in their individual careers. The majority of Nicole’s staff happens to be female, putting her in a position where she is able to continually work to pave the way to success for women in the field. She devotes herself during the workday to the growth of the people she manages, ensuring that each of them enjoy the same career growth. Woodland – De Van is a thought leader who was recognized in the industry as a PharmaVOICE 100 Top Influencer and an HBA Rising Star.